A United Space Alliance shuttle external tank technician sands off the residue from a liquid oxygen feed line bracket after the removal of cracked ablator material and exterior foam. 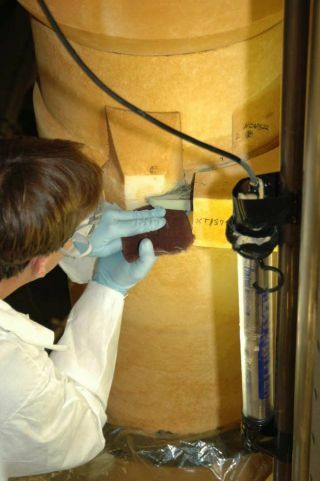 The repair will help prevent foam debris during the October 2007 launch of shuttle Discovery. NASA engineerswill patch up the last of four brackets with cracked insulation on the nextspace shuttle fuel tank to fly Friday to help prevent the same type of foamdebris that dinged the Endeavour orbiter earlier this month. Fuel tankworkers were a bit ahead of their nine-day schedule to stripoff cracked layers of ablative cork from the tank at the agency's Kennedy Space Center (KSC) in Florida, NASAspokesperson George Diller told SPACE.com. The fueltank repair must be complete before the 15-story vessel can be attached to thetwin solid rocket boosters that will help launch the shuttle Discovery onNASA's planned Oct. 23 construction flight to the International Space Station(ISS). NASAdiscovered the cracks in five brackets on Discovery's fuel tank during X-rayscans after a piece of foam insulation popped free from Endeavour's own tankand dingedthe orbiter's underbelly during an Aug. 8 launch. Only four of the five bracketson the new tank are in need of repair, Diller said. "We'vedefinitely found where our problem is," Diller told SPACE.com,adding that Discovery's fuel tank could be attached to its rocket boosters bySept. 5 depending on the success of today's work. The cracksrun through a layer of ablative cork and silicone, now found to be unnecessary,sandwiched between the tank's aluminum brackets and their outer layers of lightweightfoam insulation. The brackets themselves help secure a liquid oxygen feed lineto the outer hull of the tank. During Endeavour's launch,a piece of foam - with the denser ablative material and possibly ice attached -fell from the orbiter's fuel tank, then unexpectedly ricocheted off a metalstrut to etch a small gouge into the fragile heat-resistant tiles along its underbelly.The damage posed no risk to the spacecraft or its seven-astronaut crew, but NASAdouble checked its next three fuel tanks to fly and ultimately found cracks inneed of repair. NASA hasworked to minimize the amount of shuttle fuel tank launch debris since a chunkof foam damaged the Columbia orbiterin 2003 at liftoff, leading to the loss of the spacecraft and its crew duringreentry. On Monday,engineers began the delicate task of cutting out the ablative layer on the brackets,then recoating each area solely with foam insulation. The last two of the fourbrackets under repair will receive new foam insulation today, Diller said. Once engineerscut down to the cracked ablative material, the cork-like substance simply poppedout, supporting suspicions that similar subsurface cracks led to the foamdebris that damaged Endeavour, Diller added. NASA officials have speculatedthat the cracks may have formed during the fuel tank manufacturing process. "Why itwas cracking, I think, is still a subject of some discussion," Dillersaid. "But we've removed the source of the problem." NASA wasalready working on a permanent fix for its shuttle fuel tank brackets, whichinvolves replacing the aluminum fittings with new ones made of titanium, whenthe cracks were discovered. The first tank with the new brackets is set to flyon NASA's planned April 2008 shuttle flight. Commandedby veteran shuttle flyer Pamela Melroy, Discovery's STS-120 mission is slatedto deliver the newHarmony connecting node to the ISS during a planned 13-day mission. Whenfinally installed, Harmony will serve as the foundation for the addition of newinternational laboratories to the ISS.